For the past 15 years, Rolf Philipp has manufactured “bones for airplanes” in the town of Übersee on Bavaria’s Chiemsee lake. That’s what the founder and CEO of Aircraft Philipp calls the aluminum and titanium parts his company produces for the aerospace industry. His company has a combined 250 employees in Bavaria and at a second German plant in Karlsruhe — and business is going well, with the family-owned enterprise bringing in over 60 million euros in revenues last year. Recently, though, developments overseas have been making life more difficult for Philipp. Within the past eight months, the United States dollar has lost more than 10 percent of its value, with the exchange rate now standing at $1.24 to the euro. Just one year ago, Aircraft Philipp found itself profiting from an exchange rate of under $1.10 to the euro. Philipps’ most important customers, Airbus and Boeing, sell the majority of their aircraft in dollars, and their sheer power in the marketplace allows them to pass the currency risks on by also paying suppliers in dollars. If the dollar loses value against the euro, Aircraft Philipp’s profits also drop because the company’s costs are generated largely in euros. “We have a technological edge in Germany, but that doesn’t help much when the dollar falls on us like a hammer,” says Philipp. He says that if the euro exchange rate was to rise to $1.35 or higher over an extended period of time, it would become increasingly attractive for customers to make purchases elsewhere. But the European developments that have strengthened the euro represent just one side of the coin. The flip side is Donald Trump’s “America first” policies: his open interest in a weak dollar as well as a controversial cocktail of supply and demand policies — lowering taxes, rolling back regulations and the repatriation of wealth that has been parked abroad. The president’s policies are laden with enormous risks. Even though the U.S. economy has already been growing robustly for years and, with an unemployment rate of just 4.1 percent, is approaching full employment, Trump is continuing to stimulate growth — a focus that could result in an overheated economy, which would present a danger to the entire global economy. On the surface, everything appears to be in good shape. America, Europe and Asia alike are producing, consuming and investing more, and the International Monetary Fund just issued an upward revision of its forecast for worldwide economic growth to 3.9 percent for 2018 and for 2019. But the speed with which euphoria can turn into panic was on full display at the beginning of last week, when fear suddenly began to spread among markets over excessive government deficits, inflation and interest rate increases, sparking the largest point loss in Wall Street history. Even if the percentage slide on the markets was less dramatic, it is still likely that it bothered Trump a great deal. But when it comes to the weak dollar, his administration has literally talked it into existence. Trump wants to weaken the currency to promote exports, curb imports and to reduce his country’s current accounts deficit — one of the central pledges he made during the election campaign. At the World Economic Forum in Davos, U.S. Treasury Secretary Steven Mnuchin said that a weak dollar was good for the U.S. economy. Trump himself may have sounded a little more conciliatory later on, but the genie was already out of the bottle, and Mnuchin’s verbal intervention was already having an effect. The dollar fell rapidly, and the nasty term “currency war” could suddenly be heard in the hallways of Davos. “There is no longer any doubt that the U.S. government is not only waging a currency war, but is also in the process of winning it,” Joachim Fels, chief economist at mutual funds giant Pimco, says. Trump’s policies represent a threat to Europe’s recovery, a situation that has displeased the European Central Bank (ECB). But there isn’t much the ECB can do about it. Lloyd Bentsen, treasury secretary under Bill Clinton, informed the Japanese in 1993 that he urgently desired a stronger yen in order to stem the Asian trading partner’s high export surpluses. With “America First,” Trump has now elevated “beggar thy neighbor” to the status of administration doctrine. The first part of Trump’s economic policy agenda envisions stimulating the economy through tax cuts and public infrastructure investments. That would help American companies, and the rest of the world could also profit initially if the U.S. economy were to grow more rapidly and companies in Europe or Asia were to receive more orders. But it’s the second part of the Trump program that reveals the real strategic thrust. During the same weak that the treasury secretary could be heard preaching the virtues of a weak dollar, the U.S. government imposed steep import tariffs on washing machines and solar cells. The combination of a weak dollar and protectionist measures are aimed at creating a competitive advantage for American companies versus their competitors from around the world. “The government clearly wants a weak dollar right now because inflation is moderate and a weaker dollar will make it easier for the manufacturing sector to grow,” says Barry Eichengreen, a professor for economics at the University of California at Berkeley. Loose fiscal policy does in fact create downward pressure on the currency. If taxes are lowered and the government increases its spending, households then have more money at their disposal. Demand increases for goods from abroad, thus weakening their own currency. Domestically, higher demand drives prices upwards, especially when cheap imports are slapped with tariffs, so that the purchasing power of the dollar sinks. Unless, of course, the Federal Reserve steps in to counter that development with higher interest rates. That would attract investors from abroad looking for better returns and the dollar would be strengthened, but it would also jeopardize the upswing. The situation in the economy and on the financial markets is so tense right now that Trump’s policies are tantamount to playing with fire. His policies have the potential to overturn years of delicate crisis management on the part of the central banks in the U.S. and Europe and to force them into an abrupt change of course. “It’s not the right time for that kind of fiscal policy program,” says one of the world’s most influential central bank heads. Few past upswings have been as completely dependent on low interest rate policies of the kind put in place after the global financial crisis a decade ago. In addition to getting the economy back on track, they also drove up stock and real estate prices. Indeed, astronomical prices are once again being paid for company acquisitions — prices of the kind last seen in 2007. The crash in stock prices seen on Feb. 5 also revealed that banks and hedge funds are once again playing with risky bets on the financial markets that can magnify upheavals if the markets get spooked. So-called exchange-traded notes (ETN) valuing in the billions are a bet on calm market conditions and minimal changes in stock prices, but they suddenly lost all their value in last Monday’s turbulence and also intensified the downward market trend. A monitor displays stock information on the floor of the New York Stock Exchange on Feb. 5, the day of the crash. Fear is now rampant that the best of all imaginable worlds for companies, governments and speculators may soon come to an end — a world of zero percent interest rates, making debt almost completely unproblematic, investments unbelievably cheap and financial investments of all kind seemingly without risk. The volatile situation has transformed Jerome Powell into one of the most interesting appointees in Washington at the moment. His predecessor Janet Yellen has left behind an almost impossible task for the new head of the Federal Reserve. Powell likely already sensed what he was up against on this first day of work at the massive Fed headquarters on Constitution Avenue, just four blocks from the White House. Right at the start of his new job, global stock markets collapsed. It’s possible the central banker might face the same challenges as his predecessors Alan Greenspan and Ben Bernanke did when they were appointed. Greenspan had barely been in office for two months in 1987 when he had to deal with the biggest market crash seen since 1929. In 2007, meanwhile, just a year after his appointment, Bernanke was tasked with saving the country from the consequences of the subprime mortgage crisis and the massive recession that followed. 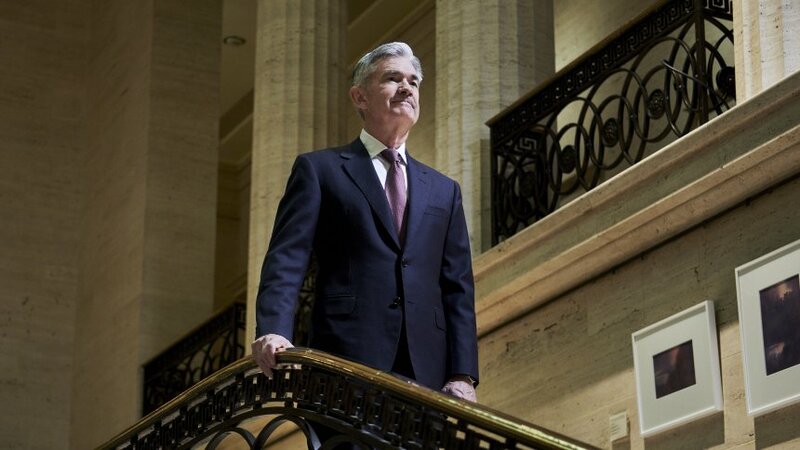 The Fed is scheduled to make its first interest rate decision under Powell in March and it’s possible he will be forced to signal to the markets whether he expects to increase interest rates at a higher frequency than the three times that have been forecast for 2018. Given the high sovereign debt level, it’s unlikely that Trump wants either higher interest rates or a stronger dollar. Experts estimate that Trump’s tax plan could increase the budget deficit over the next 10 years by an additional $1.5 trillion. The question as to whether Trump prevails, or Powell puts up a forceful challenge to the president is also of major importance for Europe. If interest rates remain low and Trump maintains his weak dollar policy, the Europeans will have a problem.